Liduina Meneguzzi, also known as “Ecumenical Flame” was born to a poor farm family. She attended daily Mass, prayed often and taught catechism as soon as she was old enough. At age 14 she began working as a servant to local wealthy families, and in local hotels. 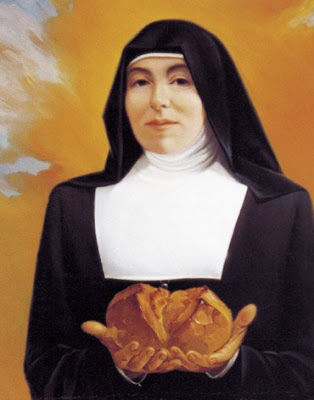 In 1926 she joined the Sisters of the Congregation of Saint Francis de Sales. She worked for years at the Santa Croce boarding school as housekeeper, sacristan, nurse and big sister to the girls. In 1937 she left for Dire-Dawa, Ethiopia, working as a nurse in the Parini Civil Hospital first with civilian patients, and after the outbreak of World War II, with injured soldiers. When the city was bombed she worked in the streets. Her work with people of different cultures, different races and different religions gave her opportunities to talk about the goodness of God the Father. She died in 1941 of cancer in Dire-Dawa, Ethiopia and was buried in the military graveyard at Dire-Dawa at the insistence of the soldiers she cared for.